We have received multiple offers. Per Sellers request, please submit final & best by Monday, August 13th @ 10 a.m. Enter through an electric gate to access this beautifully appointed home on AG exempt land! Countless updates by sellers include 2 car Garage addition with a Guest Bedroom & bath with separate access, along with a Safe Room- Storm room. 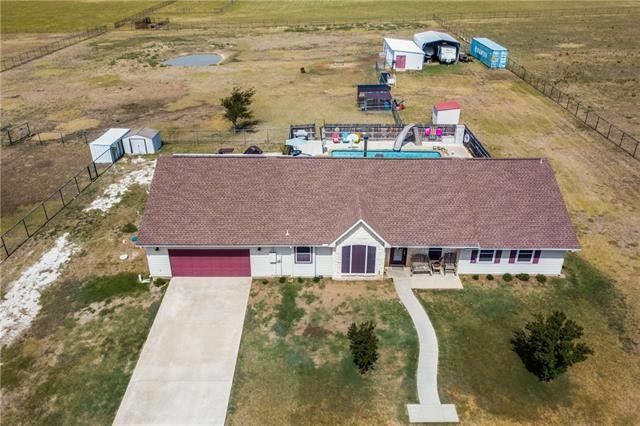 Renovated In-ground gunite diving pool with slide & separate Hot Tub, RV & Boat carport, battery backup for critical loads, solar panels, solar screens, laminate flooring, tile, updated master bath with tile & granite, wood burning pot belly stove in Den, barn with window ac unit, security cameras & more. Directions: From 35 take FM 455 West to 4-way stop at 2450, go north on FM 2450 approximately 2.3 miles and house will be on the left. Electric front gate will be open for showings. Exclusions: List of Exclusions is located in media under documents. Please refer to the list when preparing an offer.